It’s not often in the world of motorcycling that a fresh line of thinking emerges to create a new breed of machine. But Honda specializes in innovation, and the tradition continues with the X-ADV. The process: consider the attributes of the average adventure-style motorcycle – great go-anywhere appeal, an upright riding position giving superb visibility and a remarkable all-round usefulness, work or play. Then regard the typical commuter; it might be a scooter or bike but it’ll be easy to manage, nimble and loaded with convenience, efficiency and useful storage space. Combine the two together, and something interesting emerges. The machine will have a tough, stylish SUV image. It will be fully at home navigating the urban sprawl and will be loaded with all of the premium features that enable easy life in the big city. And it’ll have the engine power and chassis ability to inject every ride with the promise of adventure. 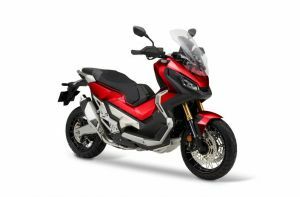 Honda’s Dual Clutch Transmission (DCT) is standard equipment and for X-ADV application selects lower gear ratios for smarter response in D mode; 3 levels of S mode are available with shift patterns to allow sportier riding. For 2018 a G switch has been fitted to enhance the off-road performance. Perfectly matched to DCT, the X-ADV’s 745cc twin cylinder engine puts out strong low-to-mid range torque, delivering attention-getting acceleration from very low rpm. It returns 27.9km/l (WMTC mode) and now features 2 Level Honda Selectable Torque Control (HSTC), which can also be turned off. Also available for 2018 is a 35kW version allowing A2 licence holders to enjoy the X-ADV. This new version can easily be converted to a full power version at the appropriate time at a Honda dealer. The X-ADV uses a Smart Key, which lives in the rider’s pocket and does away with the need to use a key for ignition, fuel cap and seat. It has two switches: Smart function on/off and ‘answer back’, which flickers the indicators for identification from a distance.